My kids love the gumbo. Last time I made it, I used okra for the first time and nobody complained. If you can’t find okra, frozen green beans are a family favorite. I rarely have time to grill the chicken before, so I either buy already grilled at the deli (expensive) or I cut up the chicken and blanch it in chicken or vegetable stock. 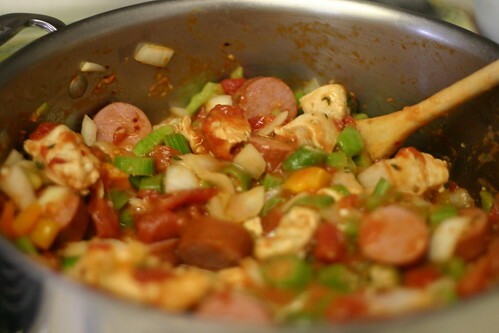 Gumbo is great the next day for lunches. Combine flour and oil in a Dutch oven; sauté over medium-high heat for 3 minutes. Add onion and the next 6 ingredients (onion through ground red pepper); cook 3 minutes or until tender, stirring frequently. I am glad you posted about the broth. I wondered the exact same thing when I first read this recipe! I am pretty sure broth refers to the juice from the diced tomatoes. I’ve nominated your blog for a blog award, which you can read about on my blog, if you’re interested.